In scientific terms, phylogeny is the evolutionary history and relationship of an organism or group of organisms. A phylogeny describes the organisim’s relationships, such as from which organisms it may have evolved, or to which species it is most closely related. Phylogenetic relationships provide information on shared ancestry but not necessarily on how organisms are similar or different. Scientists use a tool called a phylogenetic tree to show the evolutionary pathways and connections among organisms. A phylogenetic tree is a diagram used to reflect evolutionary relationships among organisms or groups of organisms. Scientists consider phylogenetic trees to be a hypothesis of the evolutionary past since one cannot go back to confirm the proposed relationships. In other words, we can construct a “tree of life” to illustrate when different organisms evolved and to show the relationships among different organisms ((Figure)). Unlike a taxonomic classification diagram, we can read a phylogenetic tree like a map of evolutionary history. Many phylogenetic trees have a single lineage at the base representing a common ancestor. Scientists call such trees rooted, which means there is a single ancestral lineage (typically drawn from the bottom or left) to which all organisms represented in the diagram relate. Notice in the rooted phylogenetic tree that the three domains— Bacteria, Archaea, and Eukarya—diverge from a single point and branch off. The small branch that plants and animals (including humans) occupy in this diagram shows how recent and miniscule these groups are compared with other organisms. Unrooted trees do not show a common ancestor but do show relationships among species. In a rooted tree, the branching indicates evolutionary relationships ((Figure)). The point where a split occurs, a branch point, represents where a single lineage evolved into a distinct new one. We call a lineage that evolved early from the root that remains unbranched a basal taxon. We call two lineages stemming from the same branch point sister taxa. A branch with more than two lineages is a polytomy and serves to illustrate where scientists have not definitively determined all of the relationships. Note that although sister taxa and polytomy do share an ancestor, it does not mean that the groups of organisms split or evolved from each other. Organisms in two taxa may have split at a specific branch point, but neither taxon gave rise to the other. A phylogenetic tree’s root indicates that an ancestral lineage gave rise to all organisms on the tree. A branch point indicates where two lineages diverged. A lineage that evolved early and remains unbranched is a basal taxon. When two lineages stem from the same branch point, they are sister taxa. A branch with more than two lineages is a polytomy. The diagrams above can serve as a pathway to understanding evolutionary history. We can trace the pathway from the origin of life to any individual species by navigating through the evolutionary branches between the two points. Also, by starting with a single species and tracing back towards the “trunk” of the tree, one can discover species’ ancestors, as well as where lineages share a common ancestry. In addition, we can use the tree to study entire groups of organisms. 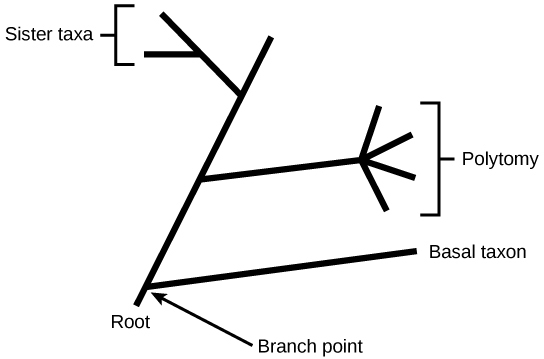 Another point to mention on phylogenetic tree structure is that rotation at branch points does not change the information. For example, if a branch point rotated and the taxon order changed, this would not alter the information because each taxon’s evolution from the branch point was independent of the other. Many disciplines within the study of biology contribute to understanding how past and present life evolved over time; these disciplines together contribute to building, updating, and maintaining the “tree of life.” Systematics is the field that scientists use to organize and classify organisms based on evolutionary relationships. Researchers may use data from fossils, from studying the body part structures, or molecules that an organism uses, and DNA analysis. By combining data from many sources, scientists can construct an organism’s phylogeny Since phylogenetic trees are hypotheses, they will continue to change as researchers discover new types of life and learn new information. It may be easy to assume that more closely related organisms look more alike, and while this is often the case, it is not always true. If two closely related lineages evolved under significantly varied surroundings, it is possible for the two groups to appear more different than other groups that are not as closely related. For example, the phylogenetic tree in (Figure) shows that lizards and rabbits both have amniotic eggs; whereas, frogs do not. Yet lizards and frogs appear more similar than lizards and rabbits. An organism that lacked a vertebral column roots this ladder-like phylogenetic tree of vertebrates. At each branch point, scientists place organisms with different characters in different groups based on shared characteristics. Another aspect of phylogenetic trees is that, unless otherwise indicated, the branches do not account for length of time, only the evolutionary order. In other words, a branch’s length does not typically mean more time passed, nor does a short branch mean less time passed— unless specified on the diagram. 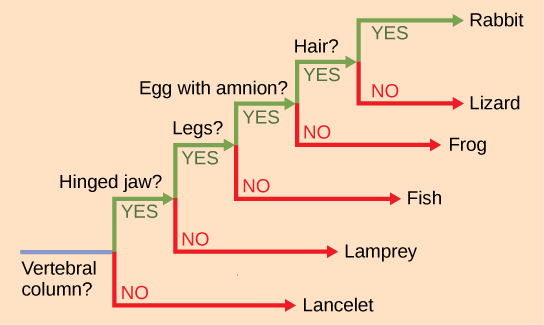 For example, in (Figure), the tree does not indicate how much time passed between the evolution of amniotic eggs and hair. What the tree does show is the order in which things took place. Again using (Figure), the tree shows that the oldest trait is the vertebral column, followed by hinged jaws, and so forth. Remember that any phylogenetic tree is a part of the greater whole, and like a real tree, it does not grow in only one direction after a new branch develops. Thus, for the organisms in (Figure), just because a vertebral column evolved does not mean that invertebrate evolution ceased. It only means that a new branch formed. Also, groups that are not closely related, but evolve under similar conditions, may appear more phenotypically similar to each other than to a close relative. Head to this website to see interactive exercises that allow you to explore the evolutionary relationships among species. Taxonomy (which literally means “arrangement law”) is the science of classifying organisms to construct internationally shared classification systems with each organism placed into increasingly more inclusive groupings. Think about a grocery store’s organization. One large space is divided into departments, such as produce, dairy, and meats. Then each department further divides into aisles, then each aisle into categories and brands, and then finally a single product. We call this organization from larger to smaller, more specific categories a hierarchical system. The taxonomic classification system (also called the Linnaean system after its inventor, Carl Linnaeus, a Swedish botanist, zoologist, and physician) uses a hierarchical model. Moving from the point of origin, the groups become more specific, until one branch ends as a single species. For example, after the common beginning of all life, scientists divide organisms into three large categories called domains: Bacteria, Archaea, and Eukarya. Within each domain is a second category called a kingdom. After kingdoms, the subsequent categories of increasing specificity are: phylum, class, order, family, genus, and species ((Figure)). The kingdom Animalia stems from the Eukarya domain. (Figure) above shows the classification for the common dog. Therefore, the full name of an organism technically has eight terms. For the dog it is: Eukarya, Animalia, Chordata, Mammalia, Carnivora, Canidae, Canis, and lupus. Notice that each name is capitalized except for species, and the genus and species names are italicized. Scientists generally refer to an organism only by its genus and species, which is its two-word scientific name, or binomial nomenclature. Therefore, the scientific name of the dog is Canis lupus. The name at each level is also a taxon. In other words, dogs are in order Carnivora. 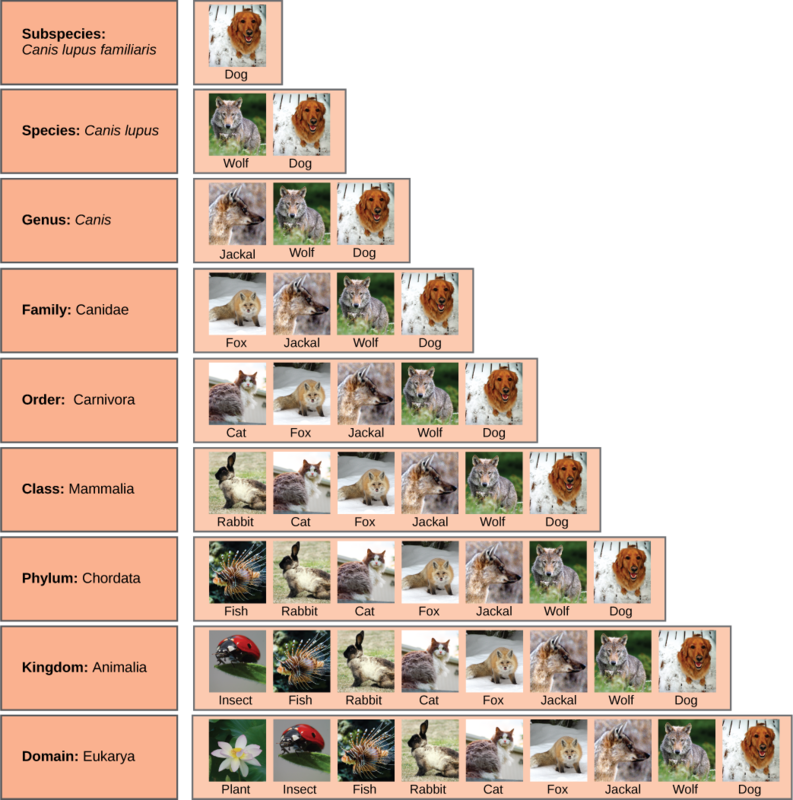 Carnivora is the name of the taxon at the order level; Canidae is the taxon at the family level, and so forth. Organisms also have a common name that people typically use, in this case, dog. Note that the dog is additionally a subspecies: the “familiaris” in Canis lupus familiaris. Subspecies are members of the same species that are capable of mating and reproducing viable offspring, but they are separate subspecies due to geographic or behavioral isolation or other factors. (Figure) shows how the levels move toward specificity with other organisms. Notice how the dog shares a domain with the widest diversity of organisms, including plants and butterflies. At each sublevel, the organisms become more similar because they are more closely related. Historically, scientists classified organisms using characteristics, but as DNA technology developed, they have determined more precise phylogenies. At what levels are cats and dogs part of the same group? Visit this website to classify three organisms—bear, orchid, and sea cucumber—from kingdom to species. To launch the game, under Classifying Life, click the picture of the bear or the Launch Interactive button. Recent genetic analysis and other advancements have found that some earlier phylogenetic classifications do not align with the evolutionary past; therefore, researchers must make changes and updates as new discoveries occur. Recall that phylogenetic trees are hypotheses and are modified as data becomes available. In addition, classification historically has focused on grouping organisms mainly by shared characteristics and does not necessarily illustrate how the various groups relate to each other from an evolutionary perspective. For example, despite the fact that a hippopotamus resembles a pig more than a whale, the hippopotamus may be the whale’s closest living relative. Scientists continually gain new information that helps understand the evolutionary history of life on Earth. Each group of organisms went through its own evolutionary journey, or its phylogeny. Each organism shares relatedness with others, and based on morphologic and genetic evidence, scientists attempt to map the evolutionary pathways of all life on Earth. Historically, scientists organized organisms into a taxonomic classification system. However, today many scientists build phylogenetic trees to illustrate evolutionary relationships. (Figure) At what levels are cats and dogs considered part of the same group? (Figure) Cats and dogs are part of the same group at five levels: both are in the domain Eukarya, the kingdom Animalia, the phylum Chordata, the class Mammalia, and the order Carnivora. What is used to determine phylogeny? What do scientists in the field of systematics accomplish? Which statement about the taxonomic classification system is correct? There are more domains than kingdoms. Kingdoms are the top category of classification. Classes are divisions of orders. Subspecies are the most specific category of classification. On a phylogenetic tree, which term refers to lineages that diverged from the same place? How does a phylogenetic tree relate to the passing of time? The phylogenetic tree shows the order in which evolutionary events took place and in what order certain characteristics and organisms evolved in relation to others. It does not relate to time. Some organisms that appear very closely related on a phylogenetic tree may not actually be closely related. Why is this? In most cases, organisms that appear closely related actually are; however, there are cases where organisms evolved through convergence and appear closely related but are not. List the different levels of the taxonomic classification system. Organizing Life on Earth by OpenStax Biology 2nd Edition is licensed under a Creative Commons Attribution 4.0 International License, except where otherwise noted.